Regularly trimming your dog’s nails is a necessary part of raising a healthy and happy pup. Without proper trimming, nails can crack and become infected. Most groomers offer nail trimming for a fee, but with the right tools and some practice, clipping your dog’s nails is something you can easily tackle in on your own. Before attempting to clip your dog’s nails, invest in some quality grooming tools. Minimize the risk of damaging your dog’s nails by using clippers that are comfortable, sturdy and sharp. There are two types of nail clippers to choose from – guillotine style and scissor style. Guillotine clippers have a hole that the dog’s nail is placed into. When the groomer squeezes the handles, a blade slices downward through the nail. Scissor clippers look and function like regular scissors. Choose whichever style you feel most comfortable with. Guillotine clippers have a reputation for being easier to use on dogs, and they offer the benefit of a replaceable blade. However, if your dog’s nails get so long they start to curl, a scissor tool will be a better choice. When you are ready to get started, lie out a towel or old sheet and create a quiet and comforting environment. Offer your dog treats for lying in the spot you designate. Return to the same place each time you clip your dog’s nails. 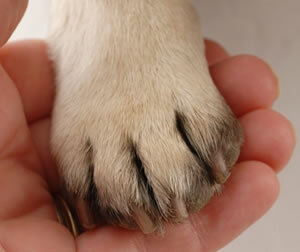 Start by inspecting each of your dog’s nails to see if there is any existing damage. Also, try to identify the quick. The quick is the part of the nail that contains blood vessels. It is much easier to identify the quick in light nails than in dark ones. The quick usually runs on the bottom of the nail along the two-thirds of the nail toward the paw. Use your trimmer to cut nails within two millimeters of the quick. If you accidentally cut the quick, the dog will feel pain and bleed. If this happens, use your styptic pencil or clotting powder to quickly stop the bleeding, offer treats and calm your dog before proceeding. You want the dog to associate this time with positive things. After you’ve trimmed the nails, you can use a special file to make them smooth. Consistency is key. The more you trim your dog’s nails the easier it will become for both of you. For tools and advice about this and other dog grooming issues, visit your local Country Store.